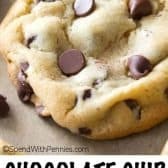 I’m pleased to introduce you to your new favorite chocolate chip cookie recipe! These chocolate chip cookies have been carefully crafted to be perfectly soft, perfectly chewy, and just all around perfectly delectable. You’ll never need another cookie recipe again! Gradually add flour mixture to wet ingredients -- stir well so that all the flour is absorbed. Scoop dough by rounded 1 1/2 Tablespoon onto prepared cookie sheets, placing at least 2" apart. Bake on 350F (177C) for 11 minutes -- cookies may still seem slightly soft in the centers, that is OK, they will cook completely on the cookie sheets. Don't over-bake or your cookies will be too hard. *You can quickly bring eggs to room temperature by placing them in a bowl of warm water for 10-15 minutes.